In a lawsuit filed last week in New York state court (see No. 651889/2018, N.Y. Co.), an art collector has sued over the problems he purportedly encountered in purchasing a sculpture by famed artist Jeff Koons. The plaintiff is Steven Tananbaum, a veteran art collector. The defendants are Jeff Koons LLC (or JKL, the entity through which Koons does business) and the elite Gagosian Gallery, which represents Koons. 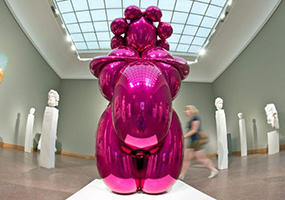 In a rather dramatically-worded complaint, Tananbaum accuses JKL and Gagosian of “unadorned avarice and conspiratorial actions in connection with the sale of factory-manufactured industrial products called Jeff Koons sculptures.” Broadly speaking, he argues that the defendants have set up an unfair system that requires would-be Koons buyers to sign non-negotiable, one-sided contracts which require hefty deposits and continued payment installments; he also argues that the “estimated completion dates” the defendants give to buyers of Koons works “are a sham from the outset” of the purchase deals. Once the collector is locked into the purchase, he urges, the defendants delay delivery of the purchased work for months or even years, putting buyers off with excuses and prevarication but little actual information. Collectors, he says, then face an “untenable” choice; if they stop making further payments in order to obtain a definite delivery date, they may lose the money they’ve already paid toward their purchase, but if they continue to make payments, the defendants retain the buyers’ money while unreasonably delaying in providing the buyer with the work, information about the progress being made on the work, or even a delivery date. He accuses Gagosian employees and Gagosian’s lawyer of supporting and enabling the scheme. Generalizations aside, Tananbaum’s claims focus on his purchase of three works: (1) Balloon Venus, which he says he contracted to buy in September 2013, with an initial estimated completion date of December 2015, and for which he has paid $6.4 million so far, but which, he has now been told, will not be complete until August 2019; (2) Eros, which he says he contracted to buy in January 2017, with an initial estimated completion date of January 2019, and for which he has paid $2.4 million so far, but which, he has now been told, will not be complete until October 2019; and (3) Diana, which he allegedly contracted to buy in December 2016, with an initial estimated completion date of August 2019, and for which, he says, he had negotiated an option to back out of the sale and receive a refund upon examination of a prototype; when the prototype was delayed, plaintiff demanded but has not yet received his refund of the $4.25 million he has already paid. Tananbaum further complains that the defendants prioritized other buyers’ orders over his, and made misrepresentations about the delays. Tananbaum’s actual claims are for breach of and anticipatatory repudiation of the various sale contracts, due to defendants’ alleged failure to deliver the works within a reasonable time; he also adds a claim for breach of the implied covenant of good faith and fair dealing as to each sale. He further alleges violations of a Uniform Commercial Code provision (N.Y. U.C.C. § 2-609) that gives parties to a sale contract the right to demand “adequate assurance of due performance,” based on the defendants’ failure to provide him with evidence (such as photographs) confirming that the works are actually in the process of being fabricated. Additionally, he brings claims under New York’s Arts and Cultural Affairs Law, invoking a provision that requires sellers of sculptures to provide certain information to buyers; here, he says, the defendants failed to provide him with accurate information about the works, including the name of the foundry producing the works, the date the works were to be fabricated, and the size of any prior edition(s) of the same sculpture, among other things. He seeks rescission of the contracts for the works; money damages, including interest and exemplary damages. He also points to a contract provision that he says obligates the defendants to indemnify him for losses, including attorneys’ fees, resulting from a breach of the contract or a representation or warranty in the contract. This isn’t the first legal tangle to come out of a Koons deal. We wrote in 2016 case (see here, here, and here) about another disgruntled buyer who sued over a delayed delivery of a Jeff Koons work. (The defendant was the Zwirner Gallery, which represented Koons in connection with the Gazing Ball sculpture at issue there.) The court ruled that a number of the plaintiff’s claims could move forward, but the parties reached a confidential settlement that ended the dispute. Indeed, that case is referenced in this complaint, with Tananbaum arguing that, after the Gazing Ball suit was filed, that work was unfairly prioritized over one of his purchases, with the Gazing Ball plaintiff receiving delivery sooner despite having made the purchase after Tananbaum’s. And in 2014, we wrote about the unsuccessful claims against Gagosian by entities connected to business mogul and art collector Ron Perelman, over Gagosian’s handling of the sale of a Koons sculpture called Popeye. These cases arise out of the tricky power dynamics that sometimes inform art transactions. When an artist’s works command astronomical prices, the demand for an artist’s work can lead to imbalances in bargaining power and one-sided contracts; if a buyer balks at the contract terms, another eager buyer is waiting to take his place. Likewise, when a powerful dealer or gallery effectively controls the market for a popular artist’s work (as Gagosian does with Koons), collectors have little choice but to accept that dealer or gallery’s terms and business practices. This case, however, will examine whether the transactions at issue here are simply a function of the economic realities of low supply and high demand, or whether the defendants’ conduct is actionable as a legal matter. The sale contracts attached to the complaint list “estimated” completion dates for the works, but do not spell out the parties’ rights in the event of a delay. This case also highlights some unique issues that can arise in art deals involving works that do not yet exist, or are still in the process of being created. Here, as other art commentators have noted, Koons’s works are often sold before they begin the lengthy fabrication process; that process may be relevant to questions regarding whether the delays experienced here were reasonable and what buyers are entitled to know about the foundry and the progress being made on the work. We’ll continue to monitor the case as it progresses. In the meantime, it serves as a reminder that art collectors should fully understand the terms of a sale contract before committing to a transaction, including understanding what is (and is not) guaranteed.